I loaded my little Toro snowblower into the CRV and drove over to the hangar around 10am this morning. I also brought along the gas can to fuel up the PowerTow, and the new Harbor Freight moving blankets that I plan to use for pre-heating. 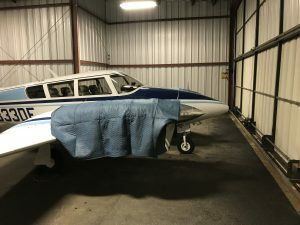 The trip this morning was to prepare for operating the airplane throughout the winter, as opposed to putting it away until March, which is my norm. I just don’t like starting the engines when it’s that cold, and the pre-flights and ramp time can be bone chilling at times as well. After the last snow storm had been cleaned up by the airfield maintenance folks, there was a 2′ swath of ice and snow left behind you can still see in the above picture. Going forward I’ll use my Toro snow thrower to clear that area right after the storm so that it melts in the sun. 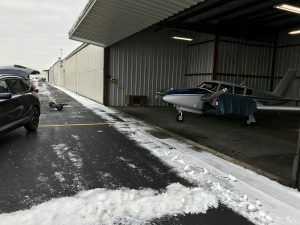 I also noticed that the ramp area immediately in front of my hangar had significant patchy ice in the early afternoon. The area was also shaded at the time, with no chance of melting in the sub-freezing temps until the next day. The exit to my hangar is a mild incline, but coupled with the ice at the base and the patchy ice above, I was afraid the airplane might slide sideways or briskly backwards if I lost traction with the PowerTow. I returned with the SnowThrower today to attack that 2′ swath of ice, and it did a credible job of shaving the ice down to a meltable layer. I got there around 10am today and could see all the ice patches were mostly melted and dry, so I certainly could have pulled the airplane out safely today. The only concern I had was that the engines and instruments were cold soaked all night down to the low twenties. My pre-heat will be here on Friday and I just thought I should wait for warmer temps. After I used the snow thrower, I used a snow shovel to move the ice chips off of my ramp area to allow it to be drying out. Next I went to work on the PowerTow. The previous day I had replaced the belt, but knew it wasn’t routed on the pulleys and guides like it should be. The correct install was throwing the belt yesterday, so I went home and studied the manual. Today I adjusted the cable that drives the belt tensioner, and put the belt back on correctly. All I had to do was continue lengthening the cable with the adjuster until the drive wasn’t engaged at idle. That did it. Fill it with regular gas and check the oil and the PowerTow is now maintained and ready. I haven’t been buying fuel here at Wilmington, so I brought gas with me today for the PowerTow. Georgetown is cheaper and they organize my fuel tax receipts for me, so I fuel there when I can. I’ll either start buying some fuel here and filling the PowerTow, or keep a small gas can in the hangar. So it seems that the hangar will work out just fine for winter operations, and give me a fabulous view of the airport while I’m polishing my spinners this spring. Life is good! Here is a shot of the moving blankets draped over my nacelles. When the new heaters come in, they’ll slide right into the cowl inlets and supposedly keep the engine cylinders at 60-70 degrees, while the oil should reach 50. The result of heating from the top will be no condensation when I leave them on all of the time. These are aircraft heaters, designed to be used where there is fuel present. I’ll place a third smaller heater in the cabin forward that will keep the instruments and cabin warm as well. All three are thermostatically controlled and designed specifically for this purpose. The moving blankets were their idea, and is what they used when during testing. Bev had been going to make me two custom nacelle covers, but we’ll try this first. I’m looking forward to evaluating the new heaters. Test Flight #5 might still be tomorrow. The temperatures overnight are projected to be warmer than last night by 5 to 10 degrees. I’m planning to go to the airport early to do my last winter flight without pre-heat. Hopefully the forecast will be true and the ramp will be safe enough to use. I’m not taking any chances of dinging a wing on the hangar, so I’ll evaluate it in the morning. It’s been a productive day. I’ve fixed my own tankless water heater system that drives our radiant heat system at home; took down a ceiling fan with a bad bearing and prepared for a new one to go in; fixed my PowerTow correctly to ensure it remains reliable; and set up my hangar to pre-pare for the heaters. I’m working again on Saturday, so hopefully I’ll get some flying in tomorrow before the weather goes south again. Fly Safe! I’ll be up there with you! !